Beautiful lakes in the Gokyo valley is the Everest base camp route through the landmarks of the Khumbu region in the company of regal soaring mountains, friendly Sherpa’s, colourful monasteries, The Namche Bazaar, The Sagarmatha National park. Trekker has to first land at Kathmandu city and on the next day or two trekkers has to take their flight to Lukla, a gateway to our trek to Gokyo. Maximum Altitudinal level is of 5360m up to Gokyo Ri. 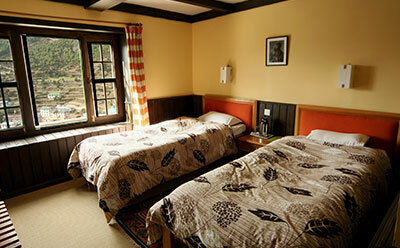 Accommodations, Meals can be arranged as per your requirements. While on the flight to Lukla you can see the range of the Himalayas. When we land on Lukla, Webegin our trekking towards Phakding then to Namche. 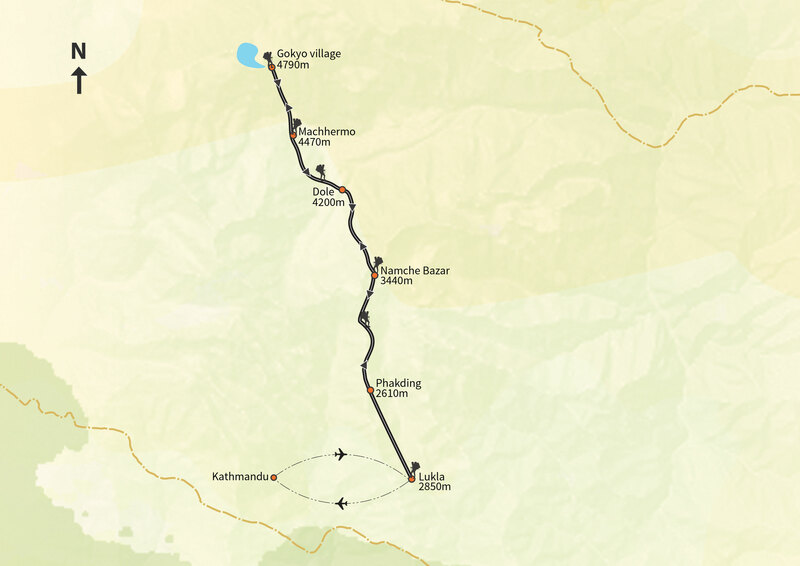 Arriving at Namche, we need to Acclimatize for a day, then we advances our route to Dole and then to Machhermo. Again in Machhermo, we have to acclimatize for a day and leave tomorrow for the Gokyo village. Arriving to the Gokyo village we take a rest day and hike to the fifth lake and in early tomorrow morning we summit Gokyo Ri and then trek to Phanga, Khumjung, Namche Bazar, Phakding, Lukla and to Kathmandu. 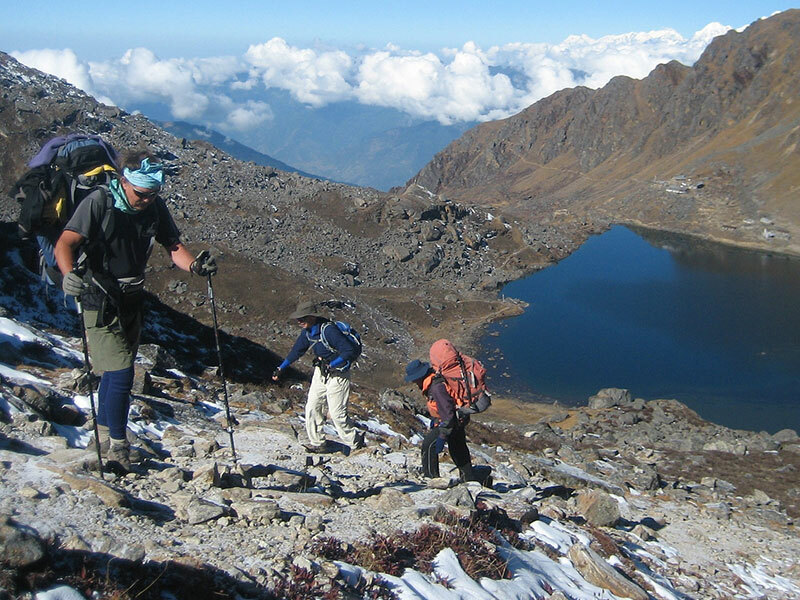 It will be a life experience with the magnificent sights of Himalayas in Khumbu region of Nepal. Visit the highest freshwater lake Gokyo. After breakfast in the hotel, we drive to the domestic terminal of Kathmandu Airport for the 30-minute flight to Lukla. Landing on the narrow, sloping runway high above the Dudh Koshi River in the heart of the mountains is a very spectacular way to arrive. We will be staying 2 nights in Namche Bazaar to acclimatise. After meeting our porters we will take lunch at the Yeti Mountain Home Lodge and then start our trek with an easy, mostly downhill leg, from Lukla to Phakding. This trek takes us through pastoral lands of the Sherpas and we pass several small villages and individual farms. 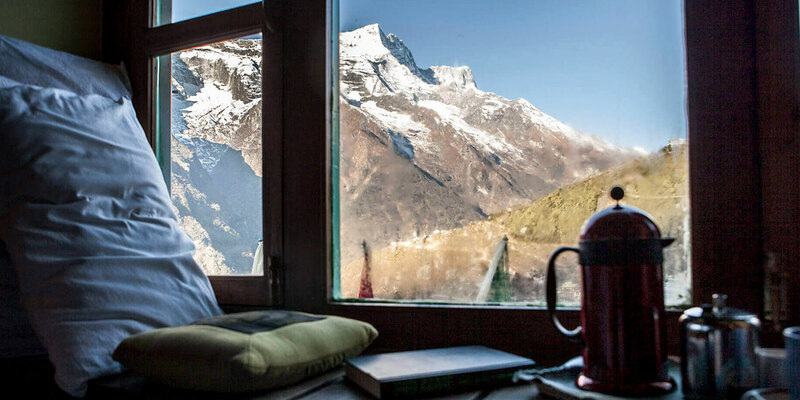 Many Sherpas now make their living exclusively from trekking and there are also many tea houses and basic lodges where it's possible to stop for a drink or a chat. We will also pass by many stones intricately carved with prayers in the evocative Tibetan script, and prayer wheels of all sizes. Everywhere in the valley colourful strings of prayer flags flutter from high points and bridges. After 2-3 hours of trekking, we finally meet the river and reach our first lodge at Phakding located beside the tumbling Dudh Koshi. The altitude at this first stop is actually lower than Lukla at 2610m. After breakfast we trek towards Monjo. 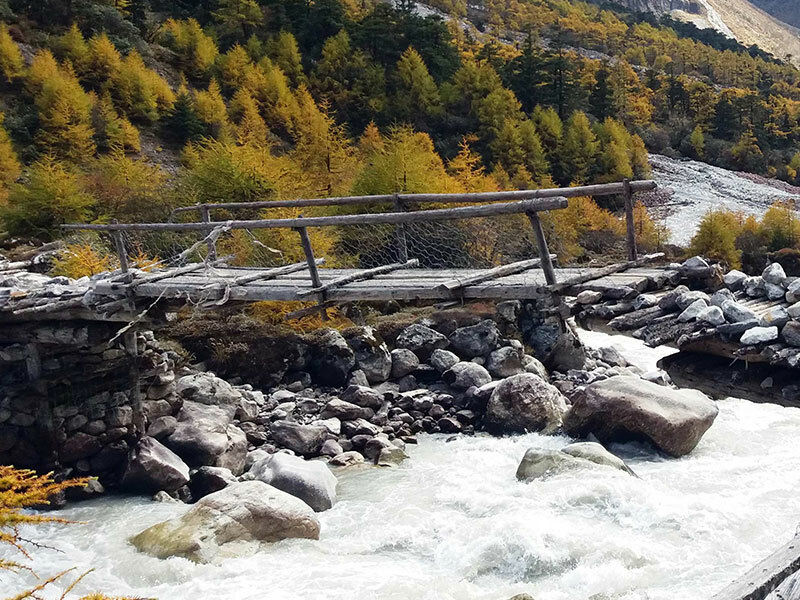 The gently undulating trail follows the right bank of the Dudh Koshi through Phakding village before the first of several river crossings today on wire suspension bridges. Continuing through pine forest and small villages we come to a break in the trees to catch sight of the mighty Thamserku (6623m) towering way above. A couple more hours of woodland trails and swaying bridges brings us to the small village of Monjo. We stop to have a look at the interesting 3D map and information boards whilst our guide sorts out our permits and entry. From here we’ve another 40 minutes or so along the sides of the Dudh Khosi before crossing the Bhote Khosi and beginning our climb to the Sherpa capital of Namche Bazaar. The trail zigzags up away from the river, gradually ascending to the tree line opening out into a high mountain bowl and the vibrant village of Namche. We pass through the many tiny shops and colourful stalls picking our way slowly up hand cut stone steps to our wonderful Yeti Mountain Home Lodge. This is our first night above 3000m so it’s important to take it easy and let your body adjust. Relax with a tea or coffee and maybe even take a massage in our spa. Situated at high altitude, Namche Bazaar serves as an acclimatization stop for climbers to avoid altitude sickness. Namche Bazaar is the main center of the Khumbu region and is facilitates with government offices, internet, ATM’s, restaurants and a colourful market. You can also take a half-day excursion to the internationally known Museum of Sherpa Culture and the traditional villages of Khunde and Khumjung. The location of our lodge is superb giving us a bird’s eye view over Namche and across the Valley to the serrated ridges of the Kongde range, while the magnificent peak of Thamserku (6623m) rises as a backdrop. Just a short walk away is a classic view of Ama Dablam, one of the most beautiful mountains in all Nepal and of Lhotse and Everest. This is an ideal place to spend the day, acclimatising to the new altitude before heading further up-valley to Thame. Today we advance to reach our next destination. We climb towards the Khumjung hill and step down to the east of the village following the broad valley advancing to the Dudh Koshi from where the route turns north. We visit Mong, the birthplace of the reincarnated Lama of Tibet who is believed to have introduced Buddhism in the Khumbu region of Nepal. The Trail descends in a series of steep switchbacks down a slope to the Phortse Thanga. Afterward, we move alongside a rhododendron forest and pass through a waterfall before reaching to Tenga and overnight in Dole. We continue our uphill trek and pass through Dole. Throughout today’s journey we will be walking alongside the Dudh Koshi River. Approximately, it will take 4 - 5 hours to reach Machhermo from Dole. The small and thorny bushes give way to scrub juniper as the altitude increases. The trail passes many summer settlements, where yaks are taken to these places to graze in the summer. Ahead of you are magnificent views of Cho Oyu, while back down the valley are the peaks of Kantega and Thamserku. Today, the valley now widens as the trail passes through the very scenic path to Phangkha. We then descend slightly, following one of the melt-water rivers which flow down the west side of the Ngozumpa Glacier. Upon crossing an iron bridge over a stream, the trail levels out as it follows the valley pass the first lake, known as Longpongo. At this point, we get a chance to observe lama’s footprints on a stone. We soon arrive second of the lakes which shimmer turquoise blue sheet of water sparkling in the sun. Walking by the side of the lake, the scenery is magnificent with the summits of Cho Oyu and Gyachung Kang reflected in its emerald green waters. Gokyo is one of the trade centers, where the Sherpa people run lodges to provide the best services to the trekkers. Gokyo itself is located by the side of Ngozumpa glacier, the biggest glacier of Nepal. We can spend this day taking a rest in the Gokyo valley and hike to the 5th lake. If we want to, we can climb a hill, also called the Scoundrel’s Viewpoint, which is located at the edge of the 5th lake. From here we get magnificent views of Cho-Oyu, Gyachung Kang, Mt. Everest, Lhotse, Nuptse, and Makalu mountains. While on the descent, the views during the return have a different point. The trail meanders around the constantly changing obstacles and affords great views of Cho Oyu and Cholatse. From Dingboche, we descend towards the Namche via the main trail of Dingboche – Somare – Pangboche – Tengboche – Namche. Due to the up and down trail, it will consume around approximately 8 hours to reach Namche Bazaar. The night will be at Namche Bazaar at one of the best lodges of the place. This tour spends 3 nights in a hotel in Kathmandu, and eleven nights on the trek in lodges (tea houses).